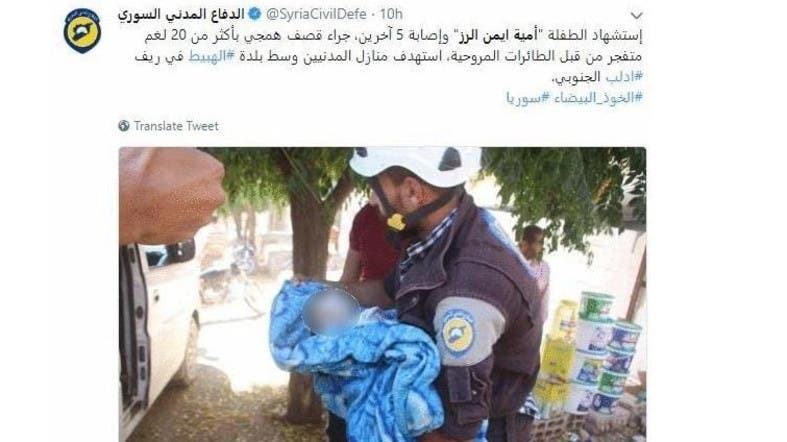 Syria’s civil defense, known as the White Helmets, said on Sunday that infant Omaya Ayman al-Roz was killed by the Syrian regime airstrikes on the town of Hbit in Idlib’s southern countryside. Omaya was killed after an airstrike targeted civilians’ houses, the White Helmets said on Twitter. The National Coalition for Syrian Revolutionary and Opposition Forces named its 41st session which was held on Sunday after Omaya. Ahmad Ramdan, the head of the media department in the opposition national coalition, said on Twitter that Omaya’s family is originally from Aleppo but they had fled to Idlib to escape the war. According to Ramdan, Omaya was killed by an explosive barrel dropped by the Syrian regime’s air force aided by the Russian air force. “Is assassinating childhood in Syria normal?” he asked. Omaya’s murder shocked activists on social media who shared photos of her when she was still alive and another after she was killed. The shelling smashed Omaya’s head from the back and damaged her skull, as can be seen from the pictures. Her eyes were closed and her lips were open perhaps after she had screamed in pain, as social media users commented. An older photo of Omaya when she was still alive showed a healthy baby holding her bottle of milk. Social media users voiced their anger over Omaya’s death and slammed the international community for letting the Syrians bear the regime’s atrocities on their own. They also called for providing international protection to people in Idlib especially after Assad and his UN envoy, Bashar al-Jaafari, voiced their intention to launch war against it with Russian and Iranian support. Syrian MP Nabil Saleh said on his Facebook page on Saturday that there was no political solution in Idlib. He incited the Assad regime to enter Idlib “to correct the historical mistake” made there.